Established in 1844, G Baldwin & Co holds claim to being London's oldest herbalist. 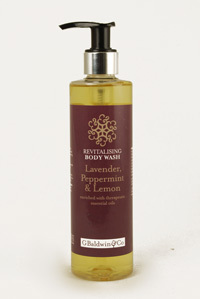 I've recently been enjoying using G Baldwin & Co Revitalising Body Wash. The packaging looks sleek and expensive, with a purple, exotic design adding a spa-like feel. I like the functional pump dispenser which delivers just the right amount of product and ensures no wastage. The blend of lavender, peppermint and lemon is unusual but very pleasant and makes for a refreshing and revitalising treat. Obviously, the body wash can be used at any time but I'd particularly recommend it for use in the mornings, post-workout or during the summer. I believe that the gel formula is sulphate free which means that it doesn't give a very rich lather but also means that it's not drying or irritating. Skin is left feeling wonderfully clean. I was surprised when I discovered that the price is just £5.09 for 250ml. This feels far more expensive and I was expecting it to be at least double.